A leader is an undeniable presence, a figure that inspires movement and improvement. But the thing about leaders is that they don’t appear from thin air; real leaders must first be led. David Hamel, local owner of Chick-fil-A at Manhattan, Kansas, says three men are responsible for crafting his leadership style. Those men taught him the most critical aspects of running a business, providing for his family, and being a leader to other people in his life. One is his dad, another a former boss, and the third just happens to be a Hall of Fame college football coach. 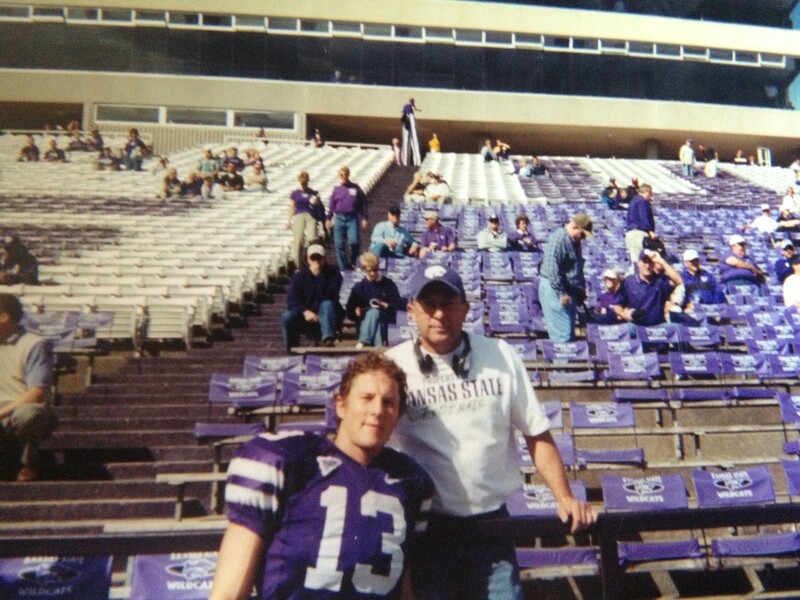 Hamel met legendary coach Bill Snyder when he tried out to be a punter at Kansas State University. Snyder’s son, Sean Snyder, also served as a coach for the team and gave Hamel the chance in 2002 to show his stuff. Hamel was shocked when he got the call saying he made the squad. The person who wasn’t stunned was his father. “I immediately called my dad,” Hamel recalls. “He said ‘I never doubted you, son. You’re the one who had to believe yourself.’” And so began lesson one: believe, even when others doubt. David Hamel and his father Larry Hamel. 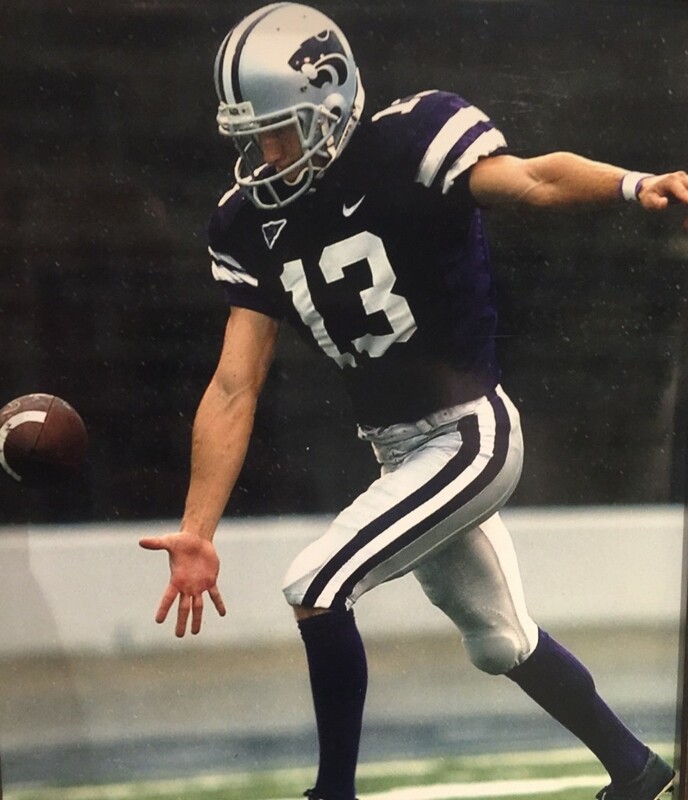 That tutorial in self-confidence lasted far beyond Hamel’s walk-on tryout and into Kansas State’s memorable 2003 season. For both Hamel and the team, that season was a challenge. He was picked to be the starting short-field punter, but had a bad practice before the season opener against California and lost the opportunity. He never got it back. And what a ride it was. The Wildcats were picked to finish near the top of the Big 12 Conference. They started off the season ranked #7 in the nation and reeled off four wins. Then the wheels fell off. K-State lost three in a row and fell out of the top 25. Some folks gave up on them, but the team never lost faith. Just like Hamel’s father told him, he believed. And so did his teammates. Under Coach Bill Snyder’s leadership, the Wildcats roared back. They won the final six regular season games and outscored their opponents by an average of 29 points per game. Then came the conference championship against the #1 team in the nation, Oklahoma. The Sooners scored first, but never scored again. Kansas State prepared, believed, and executed, scoring five unanswered touchdowns to beat Oklahoma 35-7 in one of the biggest conference upsets in history. Hamel never played a down. Though he believed in his team and his abilities, he always wondered about his purpose on the team and why he was chosen to be a Wildcat. Fast forward to 2004. Hamel married his college sweetheart, Cheryl, and moved to her hometown of Peachtree City, Georgia. He was coaching at a local sports performance gym and working part time at a coffee shop, unsure of his life’s direction. It was in that season of uncertainty that he met Mike Holmes, owner of the local Chick-fil-A. 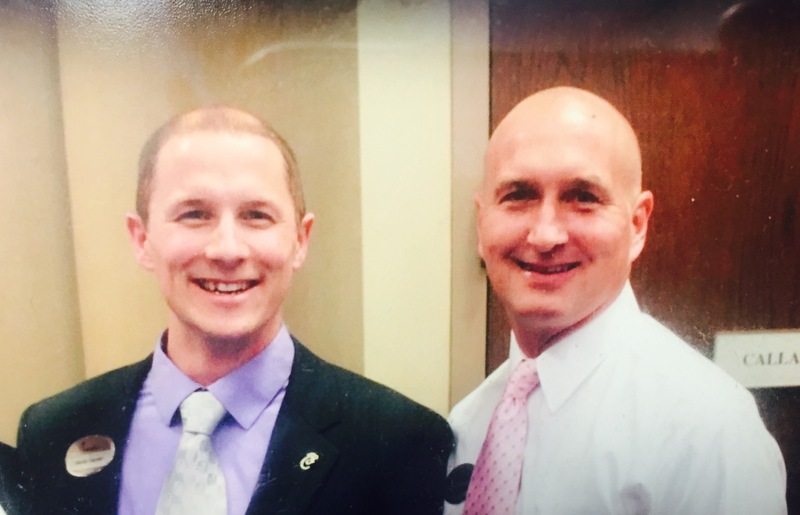 Hamel joined Chick-fil-A’s Leadership Development Program and began training under Holmes, who quickly became his mentor in both business and life. Hamel worked with Holmes for more than two years. Then Hamel and his wife moved to South Carolina, where he worked at another Chick-fil-A restaurant in Bluffton as the operations director for owner Keith Clark. Hamel credits Clark with allowing him to fail and creating that “aha moment” where Hamel knew he had what it took to run a business. Three months after arriving in the Palmetto State, Hamel got a call he will never forget. While his dad sought treatment, Hamel continued to work in South Carolina for two more years. In 2011, he moved back to Georgia to again work alongside his mentor Mike Holmes, but his eyes were on the midwest. One year later he was headed back to Kansas to become the local owner of his very own Chick-fil-A in Topeka, Kansas. Then it all came full-circle. In 2013, Hamel was named the owner of the brand-new Chick-fil-A location in Manhattan, Kansas. Not only was he going back to his college town where he made lifelong connections, it also put Hamel close to his ailing father, who was growing worse every day. The new restaurant meant Hamel was only an hour and a half away from his dad. For the last month of the elder Hamel’s life, the two spent everyday together. On January 28, 2014, Larry Hamel died. David Hamel’s former coach, Sean Snyder, attended the funeral. 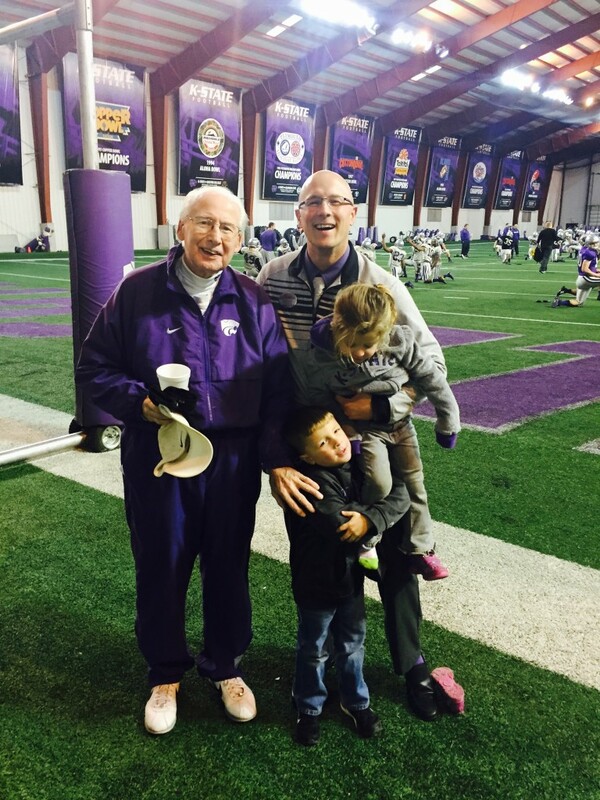 Bill Snyder sent a handwritten note, a touching gesture that has become his trademark..
Coach Bill Snyder alongside David Hamel and Hamel's children. And now, so is David Hamel. Hamel is leading by example. He exudes enthusiasm. He never limits himself. And he always believes when others doubt. It’s knowledge gained through three lessons, three inspirational men, and a lifetime of learning. Coach Bill Snyder is renowned for his leadership and his 16 goals for success. Hamel says he refers to them daily. A few of the goals are: commitment, unselfishness, unity, and discipline. You can find the rest of the list in Snyder’s book, “They Said It Couldn’t Be Done”.